I am in Japan now. Because of some technical issue (I don’t mean Japan is technically behind though) I have not been able to post as often as I would want to do. The 23rd of September was our national holiday “Autumnal Equinox Day (秋分の日)”. After this day the length of the daytime gets shorter than the nighttime day by day so this was officially the end of summer. Still it is quite hot and humid here. The daytime temperature now is just below 30°C so it is almost the same as the hottest summer day in London. 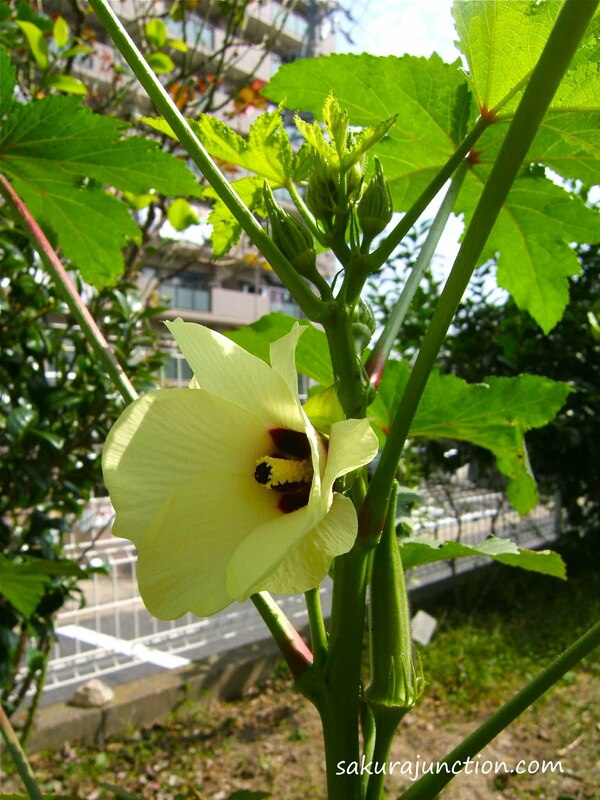 In the garden Okra is still flowering and we can harvest some. Okra is one of the vegetables I wanted to grow in London and gave up after trying for a few years. It does sprout and gets cotyledons – the first leaves but … never reaches to the point having true leaves. So, I am happy to see the plant growing here. It’s been a bit late but some Peanuts plants are also growing in the garden here. I am looking forward to harvesting home-grown Peanuts sometime soon. Is this flower of my favorite lady fingers?!!! Yes, that is correct! This is the lady flower before the finger.